The CLA lineup is an excellent representation of the high-quality vehicles that Mercedes-Benz has to offer, showcasing the elite engineering, superior comfort, and distinctive styling that are synonymous with the brand. 2017 Mercedes-Benz CLA reviews highlight the vehicle's classic and persistently stylish design and the excellent driving experience it provides. For the new model year, the 2017 Mercedes-Benz CLA in Springfield has received an extensive refresh, flaunting hot new style inside and out, as well as and upgraded tech features. The 2017 CLA is a four door coupe that comes in the option of two trims, each excellently outfitted with premium standard features. 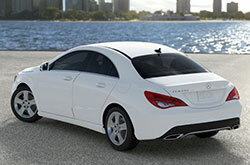 The base trim is the CLA 250. Standard features include Mercedes COMAND® tech interface, Bluetooth® connectivity, USB and AUX ports, MBTex simulated-leather upholstery and a rearview camera. The CLA can be equipped with additional features, such as keyless ignition/entry, heated seats, satellite radio, smartphone integration, upgraded suspension and an upgraded audio system, through several additional features packages or as standalone options. The next trim is the AMG® CLA 45. It comes with an upgraded engine, an alternate transmission and all-wheel drive. 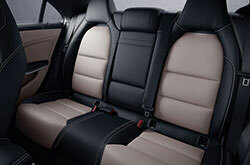 Other features include sports tuning, sports seats and upgraded upholstery. The optional upgraded features for the CLA 250 are also available on the AMG® CLA 45. The 2017 Mercedes-Benz CLA- in Springfield has two different engines for its distinct trims. Inside the CLA 250 is a turbocharged 2.0L four-cylinder engine with an output of 208 horsepower and 258 pound-feet of torque. It has a seven-speed, dual-clutch automatic transmission and front-wheel drive. Edmunds.com's 2017 Mercedes-Benz CLA review compliments the quickness of this standard engine. The AMG® CLA 45 is equipped with a more powerful turbocharged 2.0L four-cylinder engine that generates 375 hp and 350 lb.-ft. of torque, a seven-speed, AMG® tuned transmission and all-wheel drive. Standard safety features on the CLA include stability/traction control, antilock brakes, an extensive system of airbags, a rearview camera, forward collision mitigation with automatic braking and drowsy-drive warning. Each CLA also comes equipped with the mbrace2™ emergency communications system. Buyers can also add optional blind-spot monitoring, lane departure warning and upgraded forward collision warning. 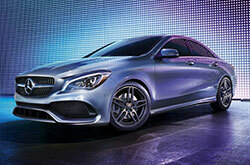 Want More Specs on the Mercedes-Benz CLA? 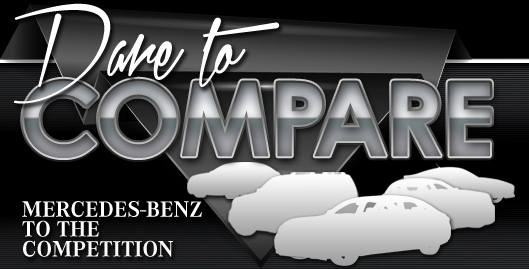 If you're not sure the 2017 Audi A3, BMW 2-series and the Acura ILX are suitable for you, then check out a 2017 Mercedes-Benz CLA Class near Springfield. Offering an passenger-oriented persona and innovative in-car technologies, it could be just what you need from a vehicle. Utilize our evaluation to see if the 2017 Mercedes-Benz CLA is right for your particular needs. Also take a glance at up-to-the-minute great short-term lease offers available at Elite Automotive Group! We're a neighborhood Mercedes-Benz car dealership where you can find amazing incentives - not only for the Mercedes-Benz CLA, but also for other new and used cars. We hope our well-researched 2017 Mercedes-Benz CLA review helped you find the details you need to make a sound buying decision. 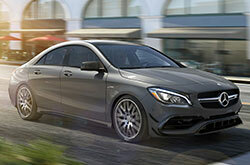 Get all set to be blown away with the new Mercedes-Benz CLA for sale at Elite Mercedes of Springfield. Set up an appointment for a test drive. If you can't wait to see it in the flesh, take a peek at its stylish design in the enclosed video clip before stopping by. Purchase prices do not include tax, title, license and $199.00 admin fee. Prices include the listed incentives. Please verify all information. We are not responsible for typographical, technical, or misprint errors. Inventory is subject to prior sale. Contact us via phone or email for more details. *MPG Based on 2017 EPA mileage ratings. Use for comparison purposes only. Your mileage will vary depending on driving conditions, how you drive and maintain your vehicle, battery-pack age/condition, and other factors. Bluetooth is a registered mark Bluetooth SIG, Inc. harman/kardon and Logic 7 are registered marks of Harman International Industries, Incorporated.